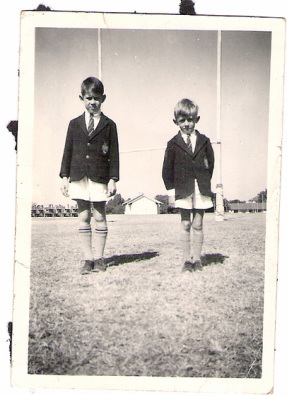 Two of the leading dramatis personae in my growing up – besides my mother and father – were, of course, my two brothers. Whether it was our military upbringing or our African childhood, we three Anderson boys were forever getting ourselves into all kinds of scrapes and intrigues. In fact, our childhood seems to be punctuated by one or other of us enduring some physical torment. Especially my brother, John, who was two years older than me and very patient and long-suffering. Colin and I did some terrible things to John. He always seemed to suffer horrendous wounds. I don’t know why. Maybe he was a little bit clumsy. He once fell on a pipe that went straight into his leg and had the same effect as one of those cheese testing devices that you screw into a cheese, and when it comes out it’s got a ring of cheese in it. John did that with the pipe. As he fell onto it, it went right into his leg, and when we pulled it away, there was a lump of meat stuck inside. He was about 15 at the time. I was 13 and Colin was 10, and we didn’t really know what to do. The piece of pipe was so old and muddy, that we didn’t know how to get the mud out, let alone the lump of flesh, so we decided to leave it there instead. John was rushed off to hospital with blood pumping out of his leg, and they just sewed the wound back up. It took years to heal properly, because there was no meat in the hole. (I always thought they should have packed it with something.) To this day, he’s got a terrible scar, like a ring where this pipe went in, skewered a core of flesh and came back out again. That wasn’t the only wounding of John that I recall. During one holiday in Nyanga, the three of us went exploring a hill where we found a clay pigeon trap. This must’ve been where the man who owned the farm sent his assistant to fire the clays, as there were big boxes of the things lying everywhere. Colin and I unpacked a few of the clays and we figured out how the firing device worked by pulling back the arm of the huge spring, putting a clay into it, and pressing a pedal. The fun began. By the time we’d fired 30 or 40 clays, John was saying, ‘Come on now, it’s time to stop.’ As it was, Colin and I would quite happily have fired all day, but, ‘No,’ John said, ‘these are somebody else’s clays. We can’t bugger about too much. Come on, you two.’ But it was rare for us to pay too much heed to our older brother’s reprimands, and so the firing continued. I pressed the pedal and the arm came shooting forward, blasting John in the leg. The force sent him flying straight over mounds and mounds of bush, and almost took his limb right off. Colin and I laughed of course as we usually did. (Colin always found these things hysterically funny.) We picked John up and looked at the damage. The two pieces of wire that held the clay in position had whacked him in the leg, and he now had two absolutely symmetrical cuts, two inches long and three quarters of an inch apart. The wires had gone at least an inch into his leg before they’d sent him flying. The three of us walked home with John dripping blood everywhere, in spite of the shirt we’d tied around his leg to try and curb the bleeding. ‘What have you done?’ said Daph, when we got back. ‘These two buggers have hit me with a pigeon shooter,’ replied John. Mum rubbed some potassium permanganate into the wound and then washed the gash with Dettol. It was always Dettol or Jeyes Fluid – it didn’t matter which. What was wonderful about my mum was that she’d lived in such rough conditions herself as a young girl growing up in Africa (described so vividly in her own book The Toe-Rags) that nothing surprised her. If you’d come in with your eye hanging out, she’d have probably said, ‘Right, come here,’ and she’d have got hold of your eye and pushed it back into the socket, saying, ‘Wiggle it about a bit. Do you see left? Do you see right? Do you see up? Do you see down? Right – fine. You’re okay.’ When she was about 8, she’d been shot by her own brother with a pellet gun just below her eye. She’d pulled the pellet out and put a piece of ice over the wound to bring down the swelling. And for days and days she’d held her hand delicately poised over her cheek every time anyone spoke to her, so that her Auntie Betty didn’t say, ‘What on earth have you done to your face?’ So when John came to Mum on yet another occasion with a pellet in his bum where we’d used him as target practice, she knew exactly what to do. It was the only time in his life that John got shot, despite going on to become a celebrated soldier with the Gurkhas. In fact, John grew up to be an excellent soldier. He was extremely trustworthy and always kept his own no-nonsense council. He was very secretive boy, very tightly wrapped. You couldn’t thread a needle of the finest thread in the world through his brain, because the shutters would come down and you’d never know the truth of what was happening in his life. And that’s what I loved about him – my private, older brother. And it was with this trusty comrade that I shared my growing-up.